Beaker offers a few different reports. 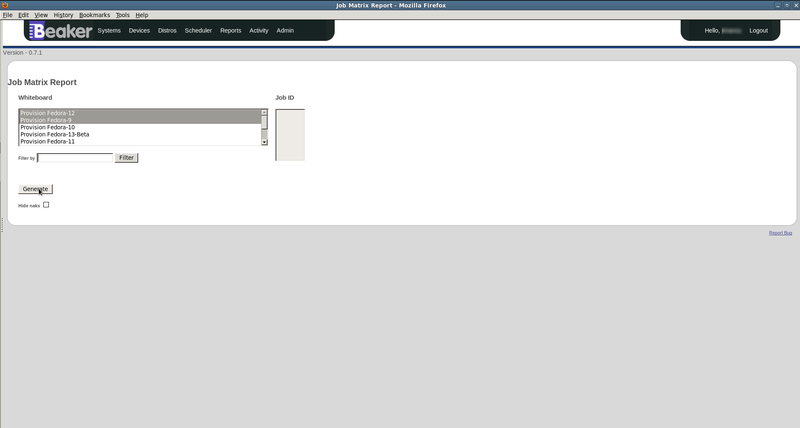 They can be accessed from the Reports menu at the top of the page. In some instances it may be preferential to provide Beaker related reports external to the Beaker server itself. If your administrator has configured any links to such reports, they will be displayed here. The “Matrix” report gives a user an overall picture of results for any given Job, or number of Jobs combined. It shows a matrix of Tasks run and the Arch that they were run on. The “Reports->Matrix” is accessible from the top menu. There are two ways of defining what Job results to display. You can select the Job by its “Whiteboard”, or by its “Job ID”. To show a Job’s Matrix report from its Whiteboard, click on the Whiteboard text in the Whiteboard select box (or select multiple whiteboards with the Ctrl key). 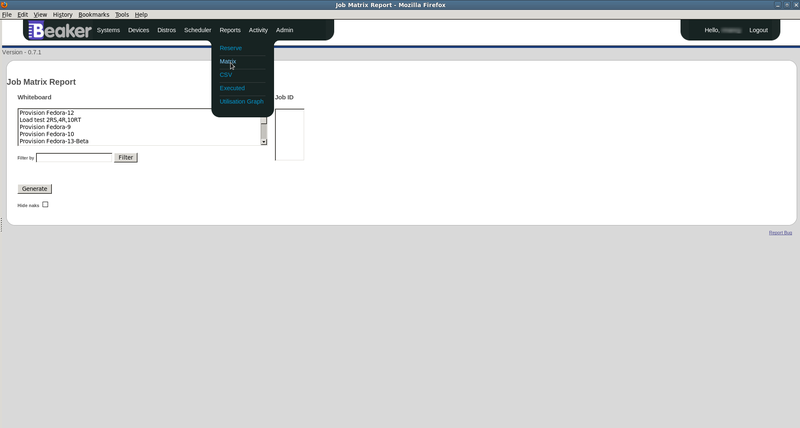 If you wish to select the Job by its ID, enter the Job ID into the “Job ID” text area. The Job Whiteboard and the Job ID are mutually exclusive when generating the Matrix report. To change between the two, click on their respective input areas. Click the “Generate” button to create the report. 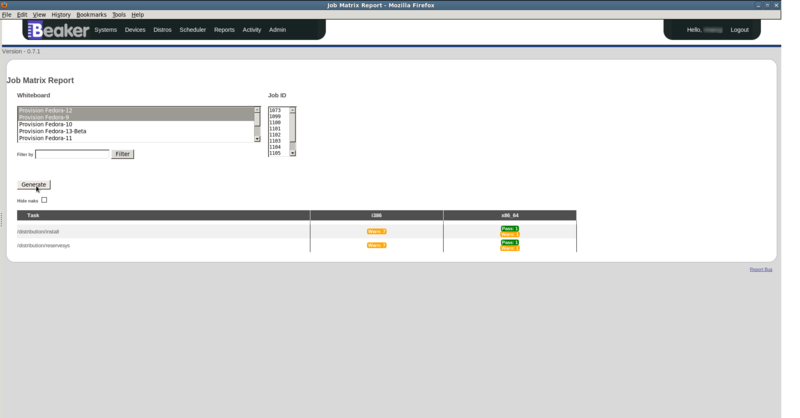 Displaying the Matrix reports of any Jobs together, is possible when selecting by “Job ID”. Enter in all the relevant “Job ID”s separate by whitespace or a newline. The generated Matrix report shows the result of each Task with its corresponding Arch and Recipe Whiteboard. The points in the matrix describe the result of the Task, and how many occurrences of that result there are. Clicking on these results will take you to the “Executed Tasks” page. See Task searching for further details.